This book is a good guide to some of the wares that the King’s Gambit (1.e4 e5 2.f4) has to offer. Johansson begins by looking at various ways by which Black can decline the gambit (e.g. 2…Bc5 and 2…Qh4+) or go onto the offensive (with Falkbeer’s 2…d5 or 2…Nc6 3.Nf3 f5!?) at move two. His focus then shifts towards the intricacies of the King’s Gambit proper, where Black accepts the pawn (2…exf4 3.Nf3), including Fischer’s supposed ‘bust’ (3…d6) and the various tendrils that make up the Kieseritzky Gambit (3…g5 4.h4 g4 5.Ne5 or 5.Nd4!? – the latter move an interesting, original product of Johansson’s own noggin). Note also that Johansson considers both the King Knight’s Gambit (3.Nf3) and the King’s Bishop Gambit (3. Bc4), a line favoured by Fischer. Some books, for example Joe Gallagher’s Winning with the King’s Gambit (1993), look only at the knight’s move. One practical advantage to playing the King’s Gambit is that you cannot get sidetracked into other open games. If you play the Spanish or the Scotch, for example, you have to reckon with encountering the Philidor or the Petroff (amongst others) instead. There’s none of that here: with 2.f4 White sets out his stall and determines the future course of the play. 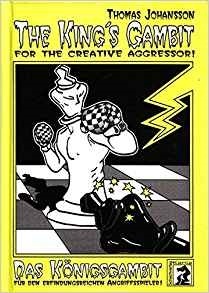 The many complex positions that the King’s Gambit gives rise to present an ideal opportunity for learning how to exploit an initiative or a lead in development, and of course for learning how to attack. Whilst Johansson’s recommended repertoire is quite narrow and focused, as he himself concedes in the introduction, it is thorough with regard to those lines that he does recommend. If you are seeking enterprising play right from the start, then why not try the King’s Gambit? A venerable opening still nowhere near to being refuted, it is an excellent choice for an attack-minded player. Johansson’s book provides a useful survey of what the opening offers. The publisher’s website is here. Adam Hunt’s excellent introduction to chess strategy uses the ‘move by move’ format pioneered by Everyman Chess. What this means is that the exercises are hard wired into the exposition: on every page, below the diagram of a crucial position, there is a question or two for you to attempt, with the answer occurring a little later in the annotations. There is a well thought out mix of classic and recent games, including games by Hunt (by no means all wins by the author) and some of his students. Just to illustrate and underline the point that, in chess, strategic principles apply universally. The book is comprehensive, covering topics ranging from the centre and king safety to prophylaxis and overprotection; from the relatively straightforward to the more advanced and (in the case of overprotection, perhaps) the problematic. As well as knowledge and concepts, Hunt touches on the skills involved in strategic play. You will learn how to evaluate a position and form a plan, how to be more resilient in defence. A final chapter looks at psychology and practical play. I was impressed by the book and also surprised to learn that it is apparently Hunt’s first. Surprised, since he is such an accomplished and engaging writer. As an IM he clearly knows what he’s talking about, equally importantly he puts across the ideas very well indeed.